Want to be notified of new releases in tvler/prop-sets? With prop-sets, you don't need to outsmart your own code when writing tests. Instead of determining fragile points of failure from particular combinations of inputs, simply generate all possible combinations and assert everything. Works with React, Vue, Jest, Mocha, etc. No dependencies. 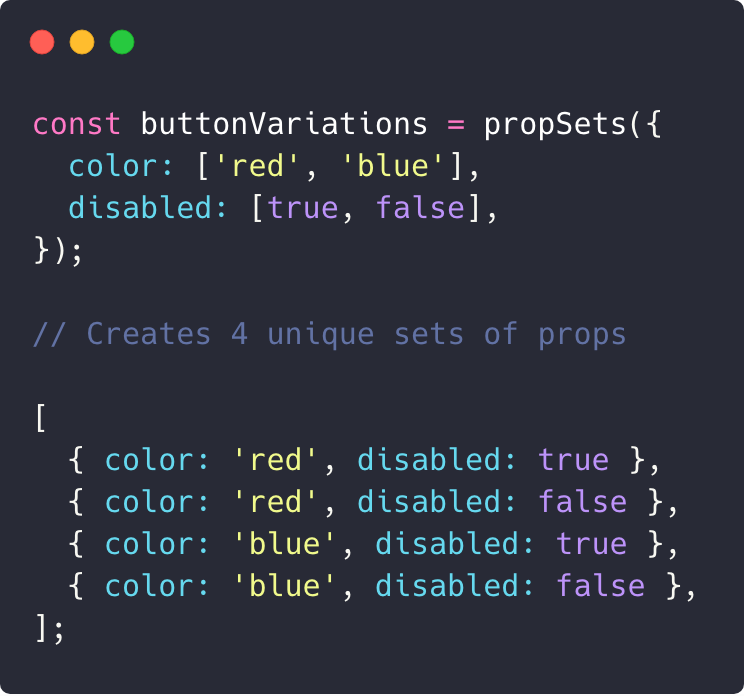 prop-sets helps you easily write tests for assertions that are based on multiple input values (in this case, disabled and color) without greatly increasing the amount of code you have to write. Because backgroundColor's value is determined by both the disabled and color prop, we need to have all three assertions to be sure the component behaves as expected. Here are some implementations of Button that will only pass certain tests but fail all others. The amount of combinations prop-sets generates is the Cartesian product of all the values passed in (a.length * b.length * c.length * ...), so as the amount of props grows, prop-sets reduces your test's complexity at an exponential rate. prop-sets comes typed but works perfectly fine without TypeScript.